I have played Fallout 4 for a little under 40 hours, if my game clock is to be believed. I have gone through all of the major faction quest lines (that were possible given the choices I made), built my decaying hometown into a vibrant settlement, made some green paint for the walls at Fenway, and decided the fate of the Commonwealth. After seeing the game’s “ending”, I looked at my map, and realized that half of it was still as blank as it had been when I left Vault 111. Welcome back to the Wasteland. In the early hours of the game, I was conflicted as to how the game matched up against its immediate predecessor, Obsidian’s New Vegas (which I consider better than Fallout 3, and might have been my favorite game of the last generation). It did not seem to have as grand of a narrative scale, nor the same breadth of choices to make. Instead, the game is more of a personal journey. But Bethesda has done a great job of weaving that story so that the choices you make impact both your character and the Commonwealth, even if it’s not as obvious as purifying water or taking control of Hoover Dam. At the same time, the base game has seen a variety of changes that may be more divisive, and the execution is nowhere near as smooth as is expected. Nevertheless, Fallout 4 is a great game that deserves the attention it has received. The first thing I noticed when engaging in the primary quest line of the game is how cinematic this game is compared to its predecessors. This is simultaneously good and bad. With regards to the story itself, this is the best work Bethesda has put out in terms of raw writing. In previous Fallout titles, the main quest often felt that it happened in isolation of everything else, and could easily be ignored. The same could be said for factions. In New Vegas, if I chose to do so I could fight for the NCR and ignore what was going on with the Legion or Mr. House. In Fallout 4, the conflict is less of an all out war and one of intrigue and sociopolitical dynamics. Things are a bit more nuanced, and the way the quest works, you’ll sort of naturally bounce around between the different factions as their separate quests interact in neat ways (until you decide which side to take towards the end game, that is). 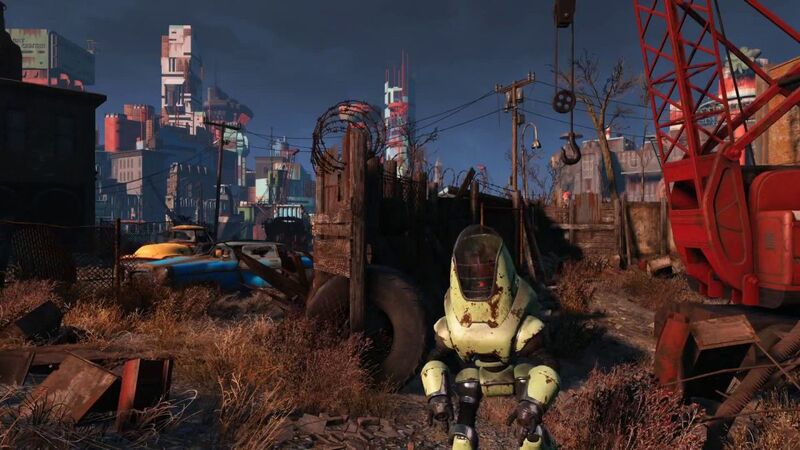 Because the narrative revolves around the Institute and their “Synths”, and whether or not “Synths” have a place in society or are a threat, it meshes well with the personal story arc and how you play says something about your character. There are some complaints to be had, however. First and foremost is the change to how dialogue works. With the addition voice acting, the old menu has been done away with and replaced with a BioWare-esque dialogue wheel. Honestly, my player having a voice really detracted from the role-playing aspect. Even worse, the dialogue options are often either not clear or downright misleading. Persuasion has also been changed somewhat, with a color-coded probability rate that seems somewhat like an RNG game to me as I failed even the easiest of attempts with a Charisma rating of 9. I preferred the straight skill checks of the old system far more. Overall, I felt that I had less control in conversations. In addition, the story does not always do the best job of explaining some pretty basic facts. For example, the game never made it clear how or why the Brotherhood of Steel and the Railroad are enemies. In one mission I saw them fight side by side, only to find they were dire enemies later on. I guess the two had conflicting views on Synths, but more importantly, didn’t they both hate the Institute? This is a trend that extends to the games new systems and mechanics. Players will find a new crafting system that seems lifted straight out of Skyrim, with one caveat: now you can construct entire towns. The only issue is finding out how it all works, as the game leaves it almost entirely up to the player. This isn’t as easy or intuitive as you might think. Fallout 4’s crafting system has a pretty bad UI. Some of the button functionality and layouts aren’t just questionable, but plain illogical. It’s a shame, because this new gameplay system is really a blast and I can’t wait to go back and devote time to playing around with it more. The core game also does a great job in utilizing it for quests and rewarding you with new building options and schematics. The theme of questionable choices permeates the game, and while it is by no means game breaking, it certainly can become frustrating. For example, scavenging and looting is now done in real-time, with a small menu popping up as you look at containers, desks, and bodies to display the contents. But, the same button used to reload also automatically retrieves all items from this menu. So, in a heated firefight, when I try to reload I have accidentally looted entire caches and bodies, overburdening myself when I need mobility. That being said, Bethesda has made great choices as well. Gun combat feels great, though it’s still important to remember that you are playing an RPG (close quarters and melee situations can still be a bit awkward). The removal of weapon degradation is much appreciated, instead putting the focus on ammunition conservation. This actually becomes a serious concern, as this game is far more difficult than the previous two titles (a good thing). It is very easy to get flat-out slaughtered when exploring in the early game, negating the old strategy of minimizing your progress to avoid tough enemies. Much of this comes from the new progress tree, which I am still conflicted on. No longer does the player assign points to skills. Now, each level grants a point to be allocated to either a perk of your choosing or a S.P.E.C.I.A.L. statistic. On one hand, each level becomes more significant as you gain only a small health boost and one point, making each choice more difficult. Furthermore, your increase in power is more evident compared to the early game where, regardless of how you assign your S.P.E.C.I.A.L. stats, you have no other boosts (as opposed to the way you could assign points to skills previously). However, because it is so important that perks be obtained as quickly as possible, it is important to know as early as possible what your build will be and assign your starting stats accordingly. This became weird for me because, despite having the ability to increase my base stats, I felt like I actually had less freedom. Creating your build had previously felt like a more natural progression that changed in reaction to the game. 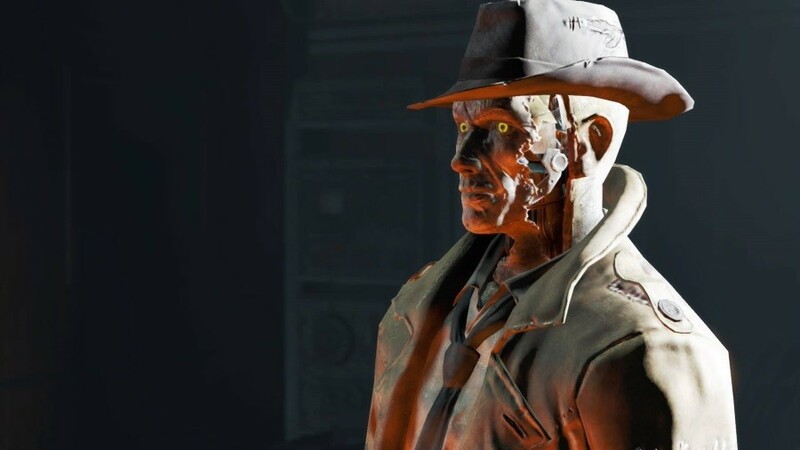 In Fallout 4, you will find yourself restricted from entire game mechanics because you don’t have a particular stat high enough to unlock the perk. This can be rectified by spending points on raising that stat, but (especially as you get higher in level) that is a hard choice to make when you need that damage bonus against increasingly difficult foes. We all know that half of Fallout is ignoring the story and combat, and exploring the world of the apocalypse. It is here that the game excels, and creates one of the greatest game environments I think I have had the pleasure of diving into. The Commonwealth, a.k.a. Boston, has been wonderfully recreated. Destroyed is probably a better description. No matter the cost of nuclear war, however, the city is packed with buildings to explore and alleys to fight through. The societies that exist within this wasteland are more vibrant and are crammed with personality. The Commonwealth is certainly more dense and lived in than previous titles in the franchise. It also helps that Bethesda has truly taken the local culture and history into consideration for the Fallout rendition. Boston makes for a great setting, but there is one big frustration that must be talked about: the game’s technical fidelity. While the art direction, as always, is able to give the game a lot of charm, one cannot deny that the Commonwealth is nowhere near as pretty as what is being achieved in games such as Witcher 3: Wild Hunt. More is expected of open world games these days, and just a little more polish could have went a long way. While the vistas look great while you are standing still, closer examination of textures do not hold up. Furthermore, battles involving large amounts of combatants or big explosions can cause severe frame rate drops. Fortunately, I experienced no glitches that interfered with quest progress, but I did have the game crash once. Little things, like Brahmin getting stuck in houses, NPCs blocking doorways, companions disappearing from the face of the Earth, and weird animations used to be funny, but now are accompanied by palms to the forehead. Except for one instance where my companion started “dancing” in front of a series of explosions…that was pretty funny. One can only hope that Bethesda is seriously considering reworking their engine for the next Elder Scrolls game. As always, Fallout taps into the depths of mid-20th century Americana and lets players shoot their plasma rifles to the tune of some great oldies. While I miss the country and cowboy flavor of New Vegas, the selection here is good and fits the urban setting. You can’t fail with hits like “The Wanderer” and “Atom Bomb Baby”. For those who want a more somber ambiance, there is also a classical station, as well as a station that plays melodies inspired by the Revolutionary Era. The original soundtrack, while still subdued, makes its presence known to a greater degree than in the past. It winds up at the right moments, and it certainly makes battles with legendary enemies more exciting when that music stirs. Still, it will all sound familiar to those who have played a Bethesda game before. While that classic theme still rocks, there aren’t any standout pieces that reach the same level. Finally, I must mention the voice work. While I don’t feel that I have as much control of what comes out of the protagonists mouth, I must applaud the performance all the same, as there are moments where I felt there was some genuine emotion. The same goes for the accompanying cast of companions, who by and large feel like they have a lot more character than those we’ve seen in the past. These games have a habit of sounding like they were voiced by one man and one woman, and while that certainly might be true here, I wouldn’t have known. As pretty as Witcher 3 was, that game had its own issues and technical problems like this game, and at the end of the day I find Fallout 4 to be more fun. That is not to ignore, belittle, or excuse the aforementioned problems, only to state that the game itself is so good as to shine through them. While it may stumble a bit in implementing the new stuff, it rarely hurts the core gameplay experience, which I can happily say is an experience that will stick with you after you put the controller down. The only question is when you will put that controller down. I’ve made it through the game’s main story and still have yet to explore almost half of what the Commonwealth has to offer, and all of the side quests and miscellaneous objectives scattered throughout. I’ve yet to find the classic bobble heads, and now that magazines grant permanent buffs, I have that many more treasures to hunt for. One must also keep in mind that the journey doesn’t end when you get that trophy. Even after completing faction and story quest lines, you’ll continue to be fed side quests for different groups. They become a bit formulaic after a while, but are loads of fun and make you feel like the “post-game” matters just as much as the story as you continue to contribute to whatever cause you so choose. Keep in mind the plethora of crafting options to explore and expand upon, and you’ll find there is certainly a lot of meat on the bones. 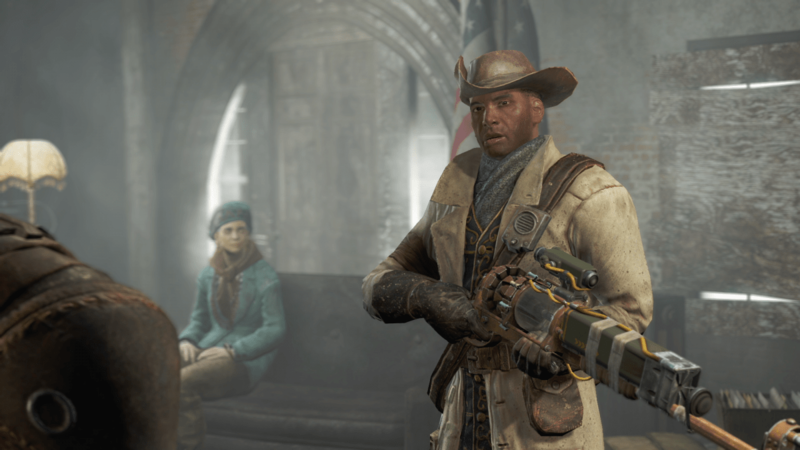 Ultimately, Fallout 4 is a progression of everything we’ve come to know and love about the franchise. It misses a few beats, but by and large is a success. As I continue to dig in, I keep thinking about what I’m missing and how I’ll do everything differently on my next play through. For me, that is the hallmark of a great RPG.